All-rounder Jesse Ryder produced career-best figures of 5-50 as Essex dominated the opening day against Leicestershire at Grace Road. The home side, bottom of Division Two, were all out for 138 in 36.4 overs. New Zealander Ryder was well supported by Graham Napier (3-43) and David Masters (2-43), while Dan Redfern's unbeaten 54 was the only score of note. Rob Taylor took two wickets in the same over in Essex's reply, but they were 15 ahead on 153-3 when rain ended play. 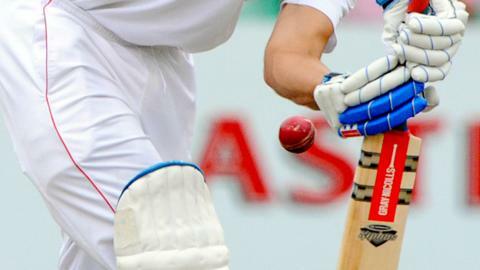 The match represents the penultimate chance this summer for Leicestershire to end a winless run in the Championship stretching back to September 2012. But the tone was set when Ryder had Angus Robson lbw for two and Ned Eckersley was caught behind off Masters in the next over. Promotion hopefuls Essex cannot afford to be anything less than ruthless as they trail second-placed Hampshire by 22 points, with only one more game to play against already promoted Worcestershire. Taylor accounted for Tom Westley and Jaik Mickleburgh, and Charlie Shreck produced an excellent delivery to have Nick Browne caught behind for 44, but Ravi Bopara (33) and James Foster (36) put on an unbroken 58 before stumps. "I was delighted to see some grass on the wicket because we desperately need a result. "Our three seam bowlers all stepped up to the plate and delivered for us." "Leicestershire have been trying to prepare pitches with a little more life in recent weeks, and this track had a decidedly green tinge when the covers came off in the morning. "Unfortunately for the Foxes, they then lost the toss, and in cloudy, humid conditions, Jesse Ryder, David Masters and latterly Graham Napier made the ball swing as well as move off the pitch. "Inevitably, the sun started to break through towards the end of Leicestershire's innings, flattening the track and reducing the humidity, and though the bowlers stuck at the task, Ravi Bopara batted with an ominous deliberation. "Essex head coach Paul Grayson revealed Bopara had bet him he would score a century on a ground where he always does well - and James Foster also showed with an impressive fluency before showers ended the day early."